North American travelers craving tropical weather should head to the eclectic destination for a robust lineup of seasonal events that showcase Mexican cuisine, sports and entertainment for every taste and budget. Riviera Nayarit, Mexico - Riviera Nayarit invites North American travelers to experience spring on Mexico's Pacific coast, with a vibrant array of seasonal events made for a wide range of travel tastes and palates. Travelers are welcome to join festivities that showcase the destination's unique culture, participate in any of the region's world-class sporting competitions and indulge in exquisite Mexican gastronomy. Rock enthusiasts should head to Explanada Mezcales for twelve hours of uninterrupted beats dropped by Spanish rock sensations Maldita Vecindad, Inspector, Genitallica, among nine other national bands. Over 15,000 attendees from around Mexico and the world are expected to join the musical celebration, in addition to several local food and souvenir stands that will be present at the festival. Tickets are set at USD$25 per person. For the third consecutive year, Food Network celebrity chef and USFOODS culinary specialist, Penny Davidi will bring together some of the biggest names in the food and wine industry for an event filled with talent, recipes and flair for gourmet cuisine. Taking place at the AAA Four-Diamond Villa La Estancia Flamingos, the four-day event will feature elegant dinners, beachside BBQs, poolside tastings, cooking classes, contests and much more. Confirmed names include celebrity chef and revered cocktail mixologist Nick Liberato, star of Top Chef Boston and Top Chef Mexico Katsuji Tanabe and the region's gastronomy ambassador, Betty Vasquez. A perfect farewell to polo season in Riviera Nayarit, the Jaguar Polo Cup will unite polo fanatics from around the globe at La Patrona Polo & Equestrian Club in San Pancho. In addition to the tournament, the four-day event will feature a movie night, culinary tastings, live music and polo clinics and classes for novices looking to play the "sport of kings." Techno music aficionados will dance to the beat of some of the best global house legends including Guy Gerber, Viceroy, Bones, Jonas Rathsman, Tom & Collins, and more. Meaning water flowing in Wixárika, the language of the region's indigenous people, RHA embraces the native Huichol culture in a paradisiacal beach setting, providing amazing views and picture-perfect moments throughout the duration of the festival. General admission tickets begin at USD$95 per person. Celebrated in the family-friendly resort town of Nuevo Vallarta, participants from all over will gather for a weekend filled with water activities in what is known as one of the destination's marquee festivals. From downwind to freestyle and regatta slalom, the event promotes the sport of windsurfing, taking advantage of Riviera Nayarit's idyllic beaches which provide the perfect setting for this exciting event. Ticket prices vary based on category and date of purchase. Riviera Nayarit offers easy connections to most major U.S. and Canadian cities through Puerto Vallarta's International Airport, making it the ideal destination for unforgettable spring getaways full of beautiful views and fun-filled events. 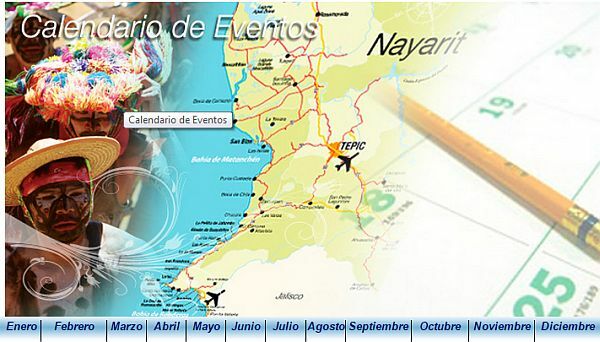 For more information and for a complete lineup of events, visit RivieraNayarit.com.